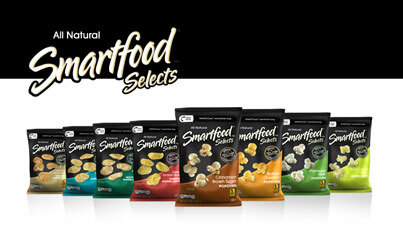 Have you tried the new SMARTFOOD® Selects line of all natural snacks? One of my favorite snacks during college was the original SMARTFOOD® White Cheddar popcorn. I was excited when I received the opportunity to sample and review the newest SMARTFOOD® Selects snack varieties, How did SMARTFOOD® Selects products stand up to review in A Mama’s Corner of the World? What are SMARTFOOD® Selects snacks? SMARTFOOD® Selects snacks contain no preservatives, no artificial colors and flavors, no msg and zero grams of trans fats. SMARTFOOD® Selects snacks spice things up with unique combinations of real herbs and spices in resealable packaging. Which SMARTFOOD® Selects snacks did we review? We were provided packages of Garlic Tomato Basil Hummus Popped Chips, Feta Herb Hummus Popped Chips, and Cinnamon Brown Sugar Popcorn for this review. How did the SMARTFOOD® Selects snacks stand up to review? The grown ups enjoyed both the Garlic Tomato Basil Hummus Popped Chips, Feta Herb Hummus Popped Chips, while the younger samplers preferred the Cinnamon Brown Sugar Popcorn. The herbs and spices were a little intense in both the Garlic Tomato Basil Hummus Popped Chips and the Feta Herb Hummus Popped Chips for the younger samplers. I personally preferred the Feta Herb Hummus Popped Chips. They were fresh, crunchy, and loaded with flavor. I think I would also like to use either variety of the popped chips in recipes--maybe as a fish or chicken coating--or in meatloaf instead of bread crumbs. The Cinnamon Brown Sugar Popcorn was a hit with the entire family--it reminded me of the original SMARTFOOD® popcorn--with the sweetness of a kettle corn. Were SMARTFOOD® Selects snacks easy to find and convenient to store? We had a tough time locating any of the SMARTFOOD® Selects a few weeks ago--but, they seem to have popped up in local Kroger stores and Meijer with a little more regularity now. The resealable snack bags are convenient and help the ingredients stay fresh. Do SMARTFOOD® Selects snacks fit our budget? These snacks retail for between $3 and $4 per bag--which is fairly typical for natural, lower-fat snack options of this quality. With a coupon--these snacks are as affordable as many store brand chips. Final thoughts on SMARTFOOD® Selects snacks? Would I buy SMARTFOOD® Selects snacks again? I would certainly buy the various popcorn varieties again--the kids loved them and I think they would fit upcoming holiday snack buffets well! I would also buy the popped chips again. They would be great for travel and road trip snacking--but, I’ll probably buy popped chips more for use in recipes and for entertaining than personal snacking. Check out SMARTFOOD® on Facebook. Disclosure: I am a Bzz Agent and I received free product samples for use in this review. As always, my opinions are my own and not influenced by the brand reviewed. What an impressive blog! So full of information. Awesome! I stopped by via the Aloha Friday Hop and left you some GFC love and support and am now your newest reader/friend #138. I am looking forward to sharing the love and support and getting to know more about you and yours! Yummy!! The white cheddar popcorn is still my favorite and it's the only popcorn I'll buy at the store. These new snacks look delish, I might have to try them :). Thanks for joining the Aloha Friday hop doll. I'm following you back! Have a great weekend!